When I was at Walt Disney World just a couple of short weeks ago, I made a stop at one of my all-time favorite counter service restaurants, Flame Tree Barbecue. 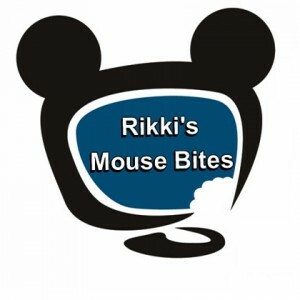 Since I don’t unfortunately get to Disney’s Animal Kingdom every trip (my hubby isn’t super big on the park) I don’t get the chance to stop for a bite here all the time. This time, I was visiting the area with my brother, so while we were excited to ride Kilimanjaro Safaris and Expedition Everest, one of my first stops had to be Flame Tree! The restaurant has many different seating areas, but perhaps my favorite is the one down by the water. 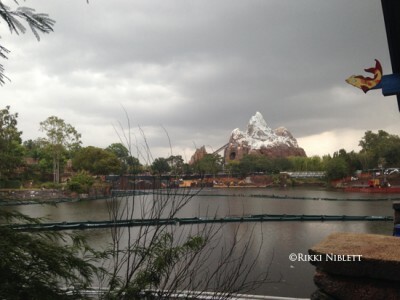 You can clearly see Expedition Everest from this vantage point, and I always think it’s fun to watch the coaster in action as I’m dining! Of course, this section is seeing lots of construction along the water for the upcoming Rivers of Light night time show that’s slated to join the park’s line up in 2016. 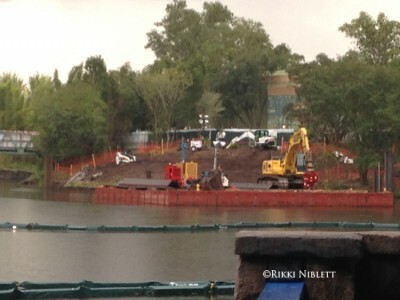 Being the Disney nerd that I am, I loved seeing the piles of dirt; it’s like your own personal view of the work! Menu offerings here are, of course, barbeque in nature, with specialties including chicken, St. Louis-style ribs, pork sandwiches, and more. What makes this restaurant even more unique is that every item features the special Flame Tree BBQ rub and items are smoked in-house. Guests order their meals at a counter and then pick them up and find a table. Condiments (including barbeque sauce) can be found in each dining section. One of my favorite things to get here is the half a chicken, which is served with baked beans and cole slaw. Though I also particularly like the pulled pork sandwich too. Of course, one of the best values is the ribs and chicken combo, which gives guests a quarter of a chicken, alongside ribs, plus two sides. This is a great deal and can easily be shared. Of course, those of you who are tempted by turkey legs, you can grab those here too. This restaurant does not offer much for vegetarians. It is obviously a stop for carnivores, however, they do offer a fruit plate featuring honey yogurt. On this particular trip though, I wasn’t super starving, but knew I needed to eat something to keep my stamina going. Something that was a substantial meal, and not something like popcorn. (Though, I could totally go for some popcorn right now!) Anyway…because I wasn’t starving, I got what I always get when I’m not starving…a kids meal. For me, kids meals are oftentimes just the right size. They also offer a drink (I love milk, so kids meals are perfect in that regard) and two sides. While I do wish that Disney had more choices in the way of kids meals, I think that overall, most restaurants try to offer something unique to them. Flame Tree is no exception and here, you can get a chicken drumstick as an option, which is exactly what I got. 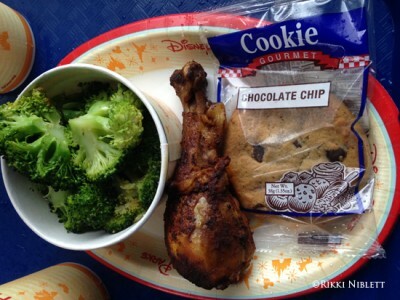 I also chose the healthy side of broccoli and the non-healthy side of a chocolate chip cookie! As I sat down, I grabbed some barbeque sauce from the condiment bar. Can I just say, with one quick bite, I was reminded at why Flame Tree Barbecue is a favorite. The meat was tender and the rub on the chicken gave it such great flavor. It isn’t a spicy or overpowering flavor (so those of you with little ones should fear not of getting this for your child), but it was a welcome flavor. (I’d gotten another chicken leg just a few days earlier from another favorite, Sunshine Seasons and hands down, Flame Tree won.) Then, when dipped in the barbeque sauce, it added another welcome explosion of flavor. Overall, the chicken from Flame Tree is cannot miss. As far as the broccoli goes, it wasn’t too limp, but it was getting close to being at that too limp point. It too had a good flavor and there was a ton of it. The cup was filled completely with large heads of broccoli. Finally, for the cookie…it was the traditional kids meal cookie. I love that it’s soft and it’s not too big, nor is it too small. It’s really just the perfect sweet for after a meal. 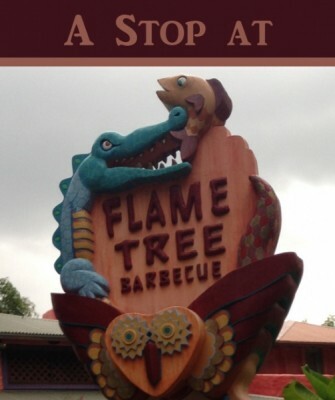 If you are in Disney’s Animal Kingdom and looking for lunch, you should make Flame Tree Barbecue your first and only stop. There’s really no other counter service here, in my mind that comes anywhere close. Of course, I say that now, but as a heads up, if you’ll be visiting the theme park at any point between January 5 and early April 2015, you’ll have to find a different place to eat. Flame Tree is going to be closed for a refurbishment during that time. Never fear, the menu and theme will all stay the same. Instead, all that’s being worked on is the seating for the restaurant. Many of the open seating areas, with no cover, are being covered. In addition, many of the pathways are being covered too. This is such a welcome change! Matter of fact, on the day that I was there, it was raining, so I had to walk with my food to the table and attempt to dodge rain from soaking my tray. So, while it will be a sad inconvenience for a few months, when all is said and done, it will be very welcome changes that take place. So, now, what do you think? 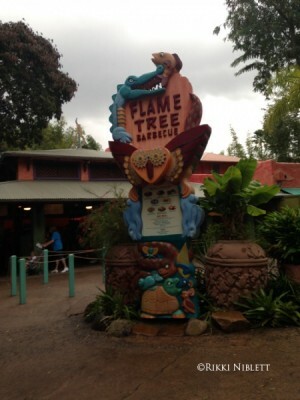 Are you a fan of Flame Tree Barbecue? Let me know your thoughts of the counter service restaurant.